Friday thru Sunday at the Convention Center. This show is usually fun and a good way to break your cabin fever. KTM, Husky, and BMW appear to be no-shows as usual but there will be more than enough entertainment from other vendors to fill a few hours of your time. We finally have a Facebook page, so if Facebook is your thing, jump on over “like” us and submit your favorite Minnesota riding photos, videos, etc. All posts made to this blog automajically get posted there too. As you may know the website DualSportMaps.com holds all the GPS data for the Trans-Minnesota Adventure Trail. It is a great site and also has a Android app that goes with it that allows you to use your Android phone as a GPS. I mount my phone to my handlebars and it works wonderfully! No need to spend $500 on the latest Garmin! 1. By going to dualsportmaps.com, creating an account, and then clicking on the Map Overlays link. You will see 2 overlays in Minnesota. 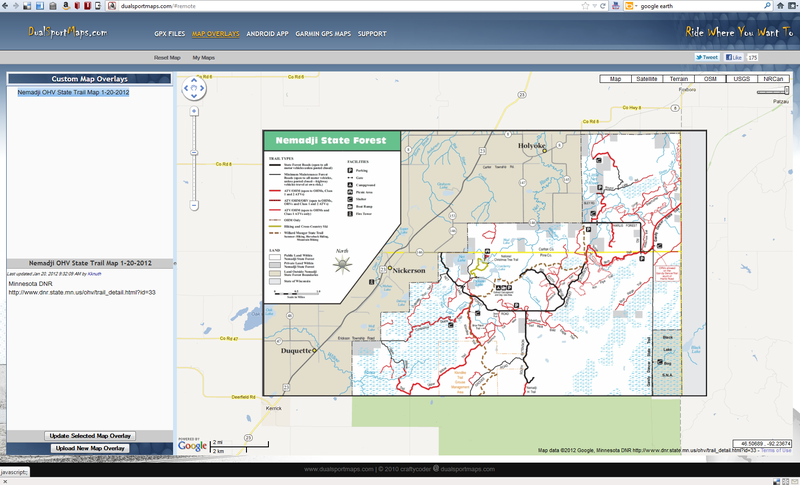 Click on them and they will show Nemadji and Chengwatana MN DNR maps inserted into the site. 2. You can also view the MN DNR OHV maps usign the DualSportMaps Android application. Why is this great? There is now no need to have a printed MN DNR map in one hand and your gps in another while navigating down the trail. Now both can be displayed at the same time on your Android Phone (I still recommend carrying paper maps as a backup in case your phone/gps fails). Also, when planning a trip there is no need to have one web browser open to the DNR website and another window open to the DualSportMaps.com website. This is just one more way technology is making this sport much more interesting. I have uploaded the Chengwatana and Nemadji state maps to the site. I hope to upload the rest of the state OHV maps soon. You are currently browsing the Minnesota Adventure Riders blog archives for January, 2012.